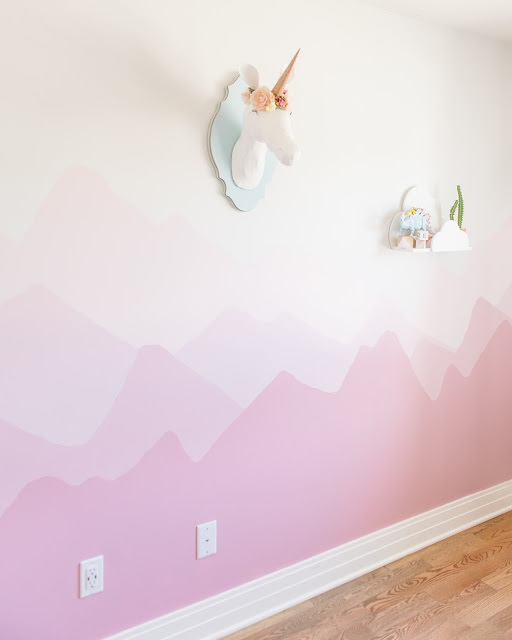 Today I am sharing one of my favourite DIY projects I have ever done, Ellia's Mountain Mural! I always knew when we built our last house that we wouldn't be there forever because we wanted Ellia to start in a school in the town which we planned to live for a long time so we aren't switching her around. 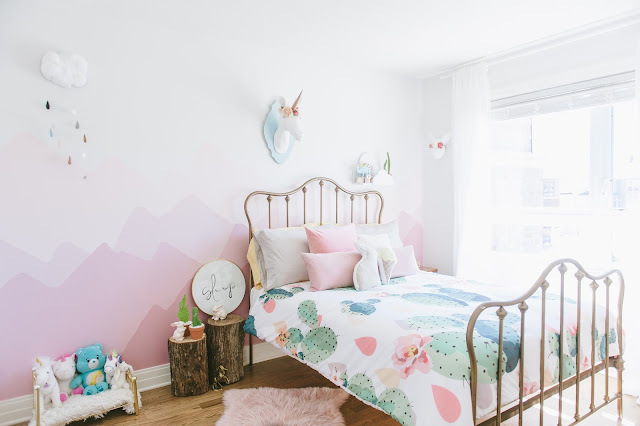 But when it came time to sell, it was a little sad because I loved her other room so much, it was such a labour of love. 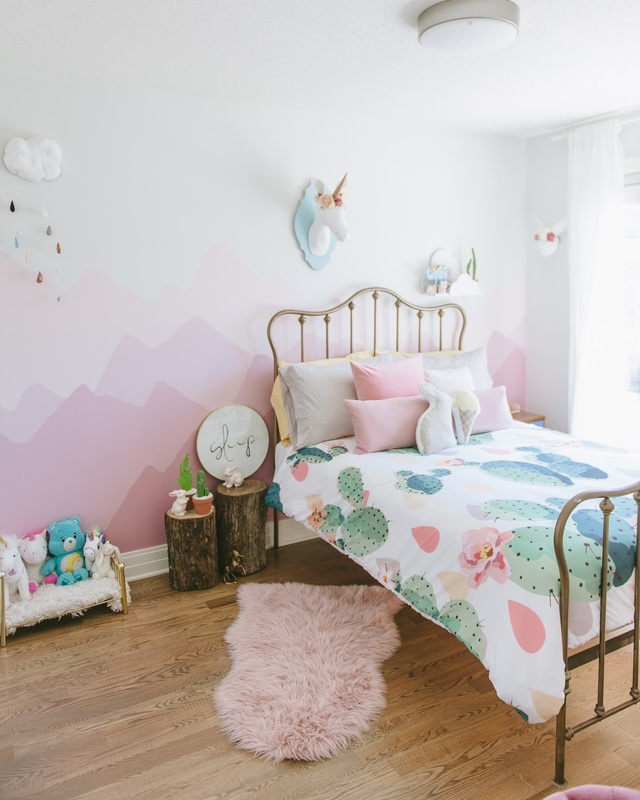 If you haven't seen it, a post can be found over at Mini Style blog here. You can also see her first nursery at Fawn Over Baby here. 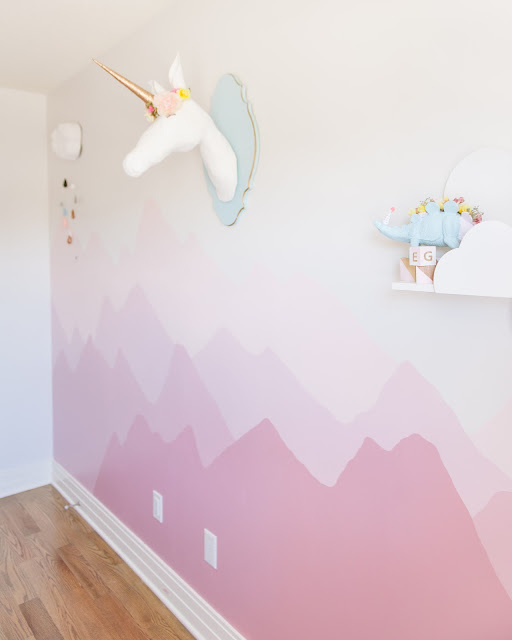 The new house is much, much smaller, and Ellia's room is about 1/3 the size. She is not a great sleeper, and either my husband or I have to stay with her to fall asleep and one of us often ends up in her bed at some point over the night so we decided to upgrade her bed to a double, even though it takes up most of the room...we were a little over sleeping on the hardwood floor. I really wanted there to be a feature wall, since that has been a theme in both her other rooms. Mercedes and I brainstormed ideas, I wanted something that was going to be pretty but not cost a fortune. 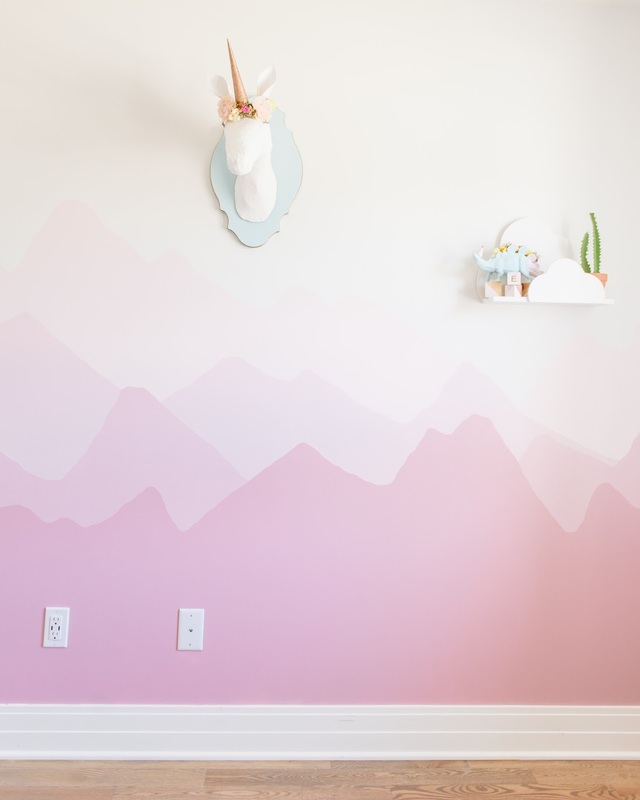 I initially wanted to do wallpaper, but since we won't be in this house for too long, and it is pretty costly, I decided to do a mural painting, it brought me back to painting murals in my high school with my art class! 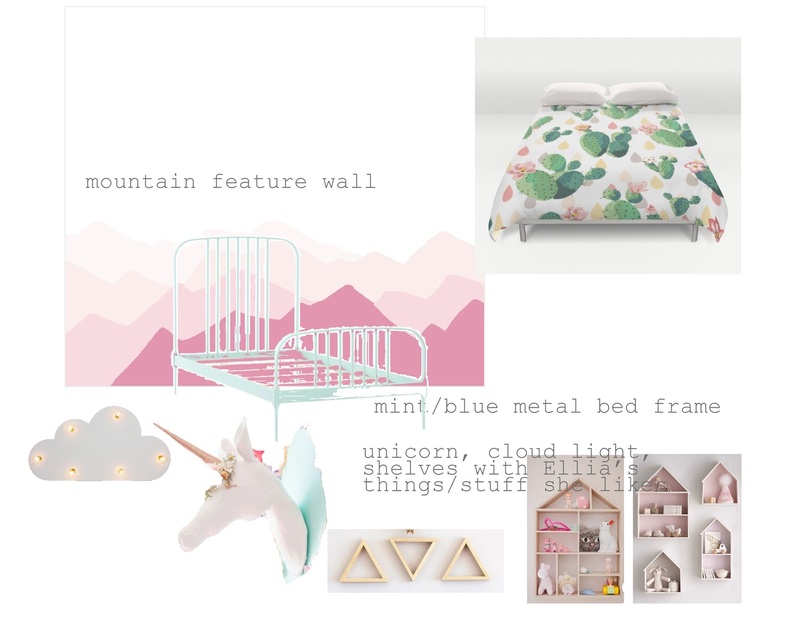 We came up with a theme for Ellia's room, which is centered around the mountain wall and her duvet, it's sort of a Whimsical California Desert thing. The mountains remind me of driving in California, with the gorgeous mountain views, it's something we don't have here in Ottawa where we live. Trying to find the correct colour paint is hard!! Here are the 3 colours I chose! 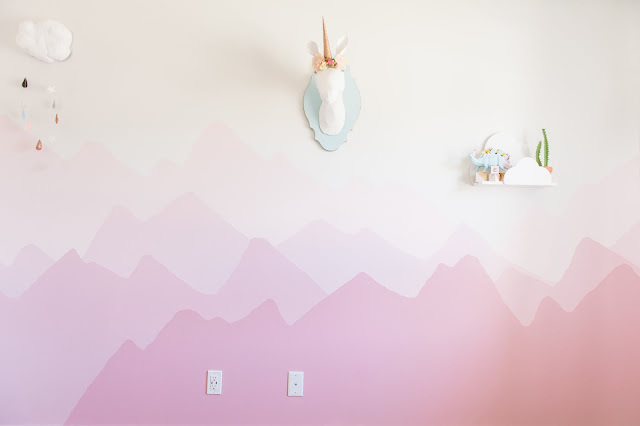 I decided to go with 4 colours on the wall, so I actually mixed the two darker colours together to get a 4th colour that would go with the gradient look. The paints are by Valspar and I only bought the sample sizes from Lowes which are about $5 each. First I hand drew a sketch of what I wanted the mountains to look like. Then using a pencil, I drew it out on the wall. I started at the bottom with the darkest colour and free handed it with a brush. 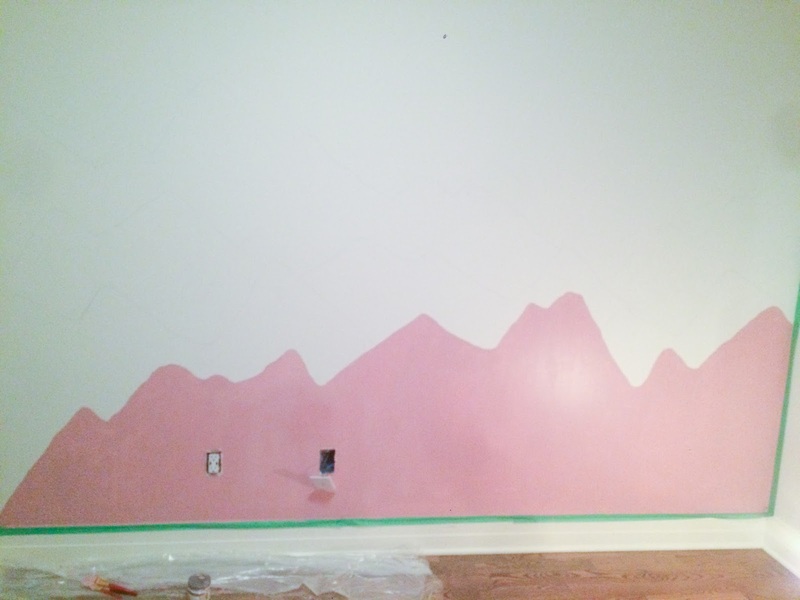 Then painted in each layer. I am so happy with the finished look, it makes us so happy to go in Ellia's room and spend time in there playing and reading. 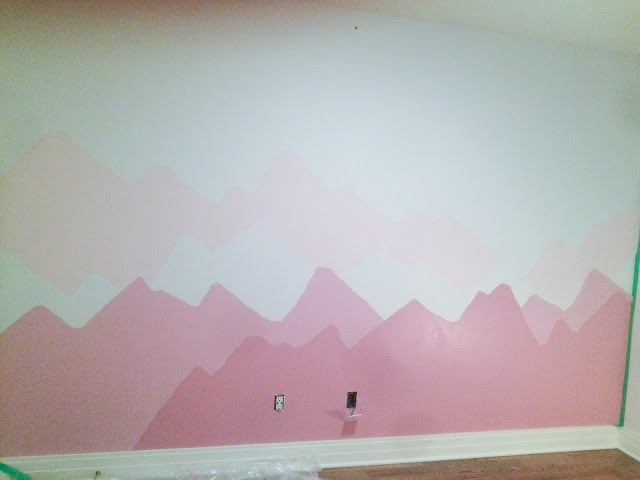 The mural was inspired by this...check out the video this girl made, it's amazing! Another post with the rest of the room and detail is coming soon!